The Internet of Things (IoT) starts with connectivity, but since IoT is a widely diverse and multifaceted realm, you certainly cannot find a one-size-fits-all communication solution. 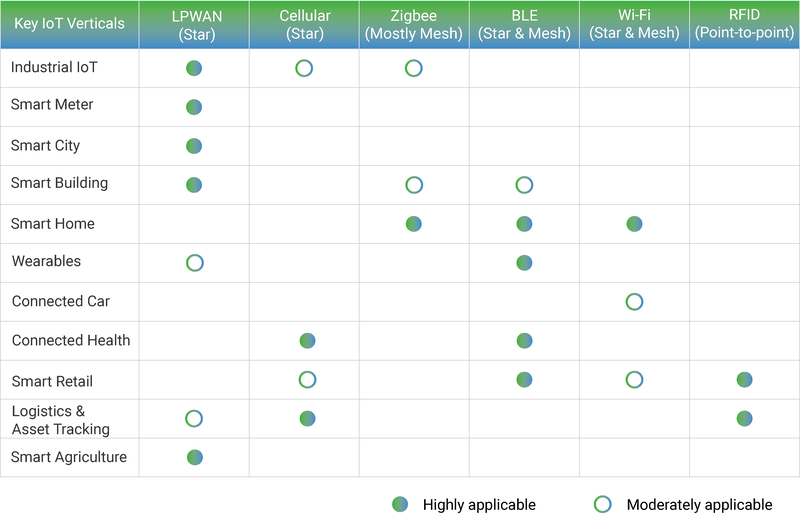 Continuing our discussion from last week on mesh and star topologies this week we’ll walk through the six most common types of IoT wireless technologies. Each solution has its strengths and weaknesses in various network criteria and is therefore best-suited for different IoT use cases. Low Power Wide Area Networks (LPWANs) are the new phenomenon in IoT. By providing long-range communication on small, inexpensive batteries that last for years, this family of technologies is purpose-built to support large-scale IoT networks sprawling over vast industrial and commercial campuses. LPWANs can literally connect all types of IoT sensors – facilitating numerous applications from remote monitoring, smart metering and worker safety to building controls and facility management. Nevertheless, LPWANs can only send small blocks of data at a low rate, and therefore are better suited for use cases that don’t require high bandwidth and are not time-sensitive. Also, not all LPWANs are created equal. Today, there exist technologies operating in both the licensed (NB-IoT, LTE-M) and unlicensed (e.g. MIOTY, LoRa, Sigfox etc.) spectrum with varying degrees of performance in key network factors. For example, while power consumption is a major issue for cellular-based, licensed LPWANs; Quality-of-Service and scalability are main considerations when adopting unlicensed technologies. Standardization is another important factor to think of if you want to ensure reliability, security, and interoperability in the long run. Well-established in the consumer mobile market, cellular networks offer reliable broadband communication supporting various voice calls and video streaming applications. On the downside, they impose very high operational costs and power requirements. 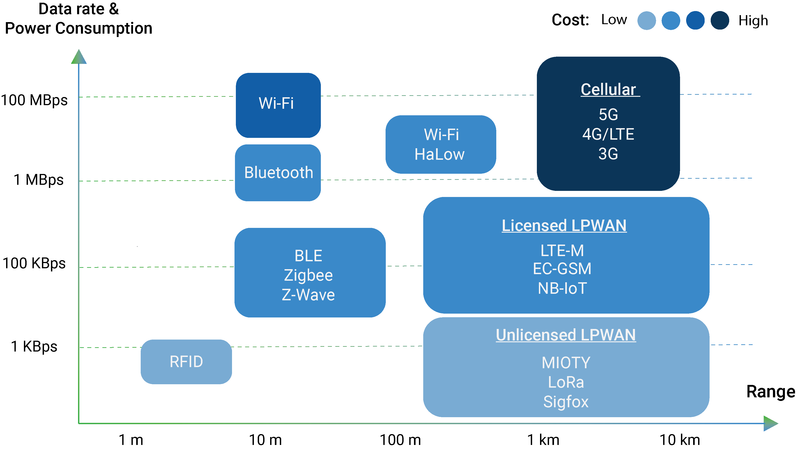 While cellular networks are not viable for the majority of IoT applications powered by battery-operated sensor networks, they fit well in specific use cases such as connected cars or fleet management in transportation and logistics. For example, in-car infotainment, traffic routing, advanced driver assistance systems (ADAS) alongside fleet telematics and tracking services can all rely on the ubiquitous and high bandwidth cellular connectivity. Cellular next-gen 5G with high-speed mobility support and ultra-low latency is positioned to be the future of autonomous vehicles and augmented reality. 5G is also expected to enable real-time video surveillance for public safety, real-time mobile delivery of medical data sets for connected health, and several time-sensitive industrial automation applications in the future. Zigbee is a short-range, low-power, wireless standard (IEEE 802.15.4), commonly deployed in mesh topology to extend coverage by relaying sensor data over multiple sensor nodes. Compared to LPWAN, Zigbee provides higher data rates, but at the same time, much less power-efficiency due to mesh configuration. Because of their physical short-range (< 100m), Zigbee and similar mesh protocols (e.g. Z-Wave, Thread etc.) are best-suited for medium-range IoT applications with an even distribution of nodes in close proximity. Typically, Zigbee is a perfect complement to Wi-Fi for various home automation use cases like smart lighting, HVAC controls, security and energy management, etc. – leveraging home sensor networks. Until the emergence of LPWAN, mesh networks have also been implemented in industrial contexts, supporting several remote monitoring solutions. Nevertheless, they are far from ideal for many industrial facilities that are geographically dispersed, and their theoretical scalability is often inhibited by increasingly complex network setup and management. Defined in the category of Wireless Personal Area Networks, Bluetooth is a short-range communication well-positioned in the consumer marketplace. The new Bluetooth Low-Energy, also known as Bluetooth Smart is further optimized for Consumer IoT applications thanks to low power consumption. BLE-enabled devices are mostly used in conjunction with electronic devices – often smartphones – that serve as a hub for transferring data to the cloud. Nowadays, BLE is widely integrated in fitness and medical wearables (e.g. smartwatches, glucose meters, pulse oximeters etc.) as well as Smart Home devices (e.g. door locks) – whereby data is conveniently communicated to and visualized on smartphones. In retail contexts, BLE can be coupled with beacon technology for enhanced customer services like in-store navigation, personalized promotions, and content delivery. There is virtually no need to explain Wi-Fi (IEEE 802.11a/b/g/n), given its pervasiveness in both enterprise and home environments. However, in the IoT world, Wi-Fi plays a less significant role. Except for few applications like digital signages and indoor security cameras, Wi-Fi is not often a feasible solution for connecting IoT end devices because of its major limitations in coverage, scalability and power consumption. Instead, the technology can perform as a back-end network for offloading aggregated data from a central IoT hub to the cloud, especially in the Smart Homes. Critical security issues often hinder its adoption in industrial and commercial use cases. A new, less known derivative of Wi-Fi – Wi-Fi HaLow (IEEE 802.11ah) – introduces noticeable improvements in range and energy efficiency that cater to a wider array of IoT use cases. Nonetheless, the protocol has received little traction and industry support so far, partly because of its low security. HaLow also operates in the 900 MHz frequency band only available in the USA, making it far from a global solution. Radio Frequency Identification (RFID) uses radio waves to transmit small amounts of data from an RFID tag to a reader within a very short distance. Till now, the technology has facilitated a major revolution in retail and logistics. By attaching an RFID tag to all sorts of products and equipment, businesses can track their inventory and assets in real-time – allowing for better stock and production planning as well as optimized supply chain management. Alongside increasing IoT adoption, RFID continues to be entrenched in the retail sector, enabling new IoT applications like smart shelves, self-checkout, and smart mirrors. To quickly sum up, each IoT vertical and application has its own unique set of network requirements. Choosing the best wireless technology for your IoT use case means accurately weighing criteria in terms of range, bandwidth, QoS, security, power consumption, and network management.